Barack Obama's Acceptance Speech: Thunder in the Rockies! The political world shook tonight as Barack Obama accepted the Democratic Party's presidential nomination at Denver's Mile High Stadium. His magnificent speech--embued with undeniable strength, keen intelligence and awesome courage--capped a truly historic day and convention. It was Barack's moment. It was America's victory. This election should not even be close! Sgt. José Enrique Ulloa: R.I.P. Sgt. José Enrique Ulloa, 23, a native of the Dominican Republic who immigrated to the U.S. at an early age, was killed Aug. 8 when his vehicle was struck by an improvised explosive device in Sadr City, Iraq. Ulloa is survived by his wife, Nieves Ulloa, and a seven-month-old son. The heritage of Puerto Ricans and their important role in forging Central Florida’s history will be celebrated in a multimedia exhibit being developed by Patricia Silver and Natalie Underberg, researchers with the University of Central Florida's Digital Ethnography Lab. “Puerto Ricans in Central Florida from the 1940s-1980s: A History” will feature photographs and stories about residents’ daily lives, politics, the economy, the charisma of leaders in the community and more. The project will cover Orange, Osceola, Brevard, Lake, Polk, Seminole and Volusia counties. The exhibit will be displayed in March and April of 2009 at the Hart Memorial Central Library in Kissimmee and the Winter Park Public Library. Parts of the exhibits also will be viewable on the World Wide Web. 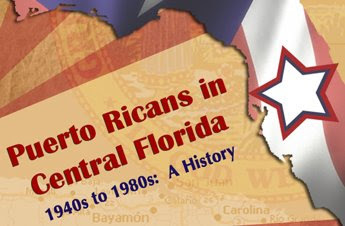 People of Puerto Rican heritage who have lived in Central Florida between the 1940s and 1980s and want to be interviewed or contribute photos can visit the Web site or contact the research team at 407-235-3601 or prcfhistory@mail.ucf.edu. The USA's lead Frat Boy, George W.Bush, appears to be doing what frat boys do on summer breaks: party hardy. So what that he's president of the United States and leader of the "free" world. The Spanish men's Olympics basketball team strike a "slanty eye" pose just prior to the Beijing games. The photographed insult was included in Spain's leading sports daily Marca on behalf of a courier company. BTW: Spain beat China in the men's competition in overtime today; while China edged Spain in the women's tournament Saturday. The Spanish men face the USA on Friday. I'm guessing that the Spanish will not show up in black-face. The opening ceremony of Beijing Olympics was the most impressive event of its kind I've ever witnessed. It was breath-taking in its technical design, orchestration and beauty. Bravo! Check the calendar of events, track the medal count and look for updates on the China Olympics 2008 blog. In Hawai'i for a respite Barack Obama took time to tell islanders that what America needs in its politics is the Aloha Spirit - i.e., respect and kindness towards others. Amen, brother! Update: See Denise Oliver's "Minorities" now the Majority in key States in the US in which she calls DKos progressives to paint Texas and Florida, Arizona, Mississippi and Nevada blue by 2012. It's a great goal. She also questions the labeling of Americans of color as "minorities" . According to its latest population projections, the so-called "minority" population in the United States reached 102,529,590 as of July 2007 -- a 2.4% increase from the year before. That's fully one-third (34%) of the total U.S. population of 301.6 million (exclusive of the populations of U.S. territories). The U.S. population included 45.5 million Latinos (excluding the 4MM residents of Puerto Rico), or 15.1% of the total population; 40.7 million African Americans (13.5%); 15.2 million Asian Americans (5.0%); 4.5 million Native Americans (1.5%); and 1 million Pacific Islanders. California (20.9 million) and Texas (12.5 million) alone accounted for 32% of all the U.S. minority population. Hawaii (75.3%), California (57.3%), Texas (52.1%) and New Mexico (57.7), plus the District of Columbia (67.5%), are now majority minority states. Additionally, minorities comprised 31-42% of the population in sixteen (16) other states. States with the fatest growing minority populations were Utah (6.1%), Idaho (5.9), Nevada (5.7%), Wyoming (4.9%), Arizona (4.7%) and Oregon (4.2%). States with the slowest minority growth rates were the District of Columbia (-0.8%), Michigan (0.4%), Hawaii (0.5%), New York (0.9%) and Ohio (1.1%). Below is the percentage of the minority population for all 50 states. In recognition of the United Nations' International Day of the World's Indigenous Peoples, this afternoon features a special concert performance with Halau I Ka Wekiu from Hawai'i as well as an indigenous Caribbean cultural presentation by members of the Cacibajagua Taino Cultural Society. Aboriginal stories, will also be featured. An Indigenous Artisan Showcase will take place in the Museum's Grand Gallery. 2:00 p.m. - "Yarning Up: 4 Short Stories from the Top End"
Several indigenous artists including Jude Norris (Cree) and Taino Spirit will display their works throughout the day. The Border Wall is a new documentary from filmmaker Wayne Ewing about the attempt by the Bush administration to erect 670 miles of walls along the 2000 mile U.S.-Mexico border. Environmentalists are outraged. Even the US Government’s Fish & Wildlife Service objects to the wall after spending $100 million dollars and 40 years to create a wildlife corridor along the Rio Grande River. And towns and cities along the Rio Grande from Brownsville to El Paso are doing everything legally within their power to stop the wall. However, the border wall--or as some prefer, the Wall of Shame--continues its destructive march as does our national nativist nightmare.